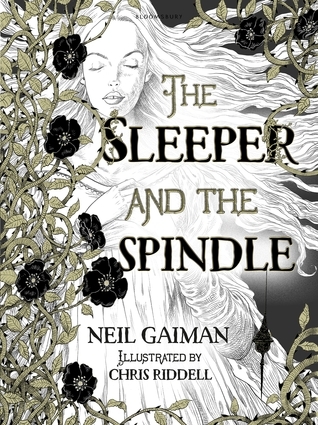 A thrillingly reimagined fairy tale from the truly magical combination of author Neil Gaiman and illustrator Chris Riddell - weaving together a sort - of Snow White and an almost Sleeping Beauty with a thread of dark magic, which will hold readers spellbound from start to finish. On the eve of her wedding, a young queen sets out to rescue a princess from an enchantment. She casts aside her fine wedding clothes, takes her chain mail and her sword and follows her brave dwarf retainers into he tunnels under the mountain towards the sleeping kingdom. This queen will decide her own future - and the princess who needs recusing is not quite what she seems. Twisting together the familiar and the new, this perfectly delicious, captivating and darkly funny tale shows its creators at the peak of their talents. Boy do I adore Neil Gaiman. I really should make my way through his complete library. He is a master storyteller, even finding ways to make two familiar stories feel brand new. Imagine Snow White is now ruling a kingdom and, about to get married, is sought out by some dwarves to help stop a sleeping curse that is creeping a little too close for comfort. And imagine a sleeping beauty trapped in a tower who might not be all she seems to be. The imagine pure awesomeness and you have a gem of a short story on your hands. This was a fantastic full-cast audiobook that was only missing the beautiful artwork by Chris Riddell. So...I also checked out the eBook to enjoy the illustrations. Had I done my homework, I would have checked them both out at the same time and gone all old school reading and listening together. My only complaint was that the story was so short. I was just getting settled into the fun and it was all over. It's a quick, fun read that you should definitely check out. In multiple formats. Be that reader. You won't be disappointed.